What is advantage of vertical cisterns over horizontal? Home>FAQ>What is advantage of vertical cisterns over horizontal? 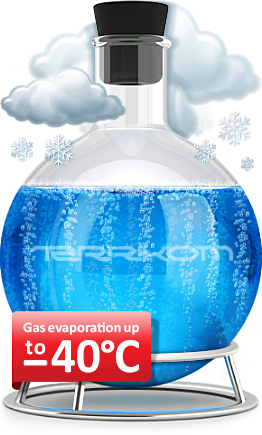 Gas evaporating in horizontal gas tank occurs at the temperature of higher than minus 20-22°С! At the temperature of -20°С! and in the depth of ground freezing of 1.5-1.7m gas in horizontal cistern will not pass from liquid to gaseous state. Horizontal cisterns for gas are designed to use them in regions where winter conditions don’t pass temperature limit of -20°С. Vertical gas tanks from «Antonio Merloni Cylinders Ghergo Group S.p.А.» really keep working capacity at the temperature till до -40°С. Vertical cisterns from «Antonio Merloni» 2.2 times more intensively evaporate gas comparing to any horizontal cistern. Vertical gas tanks fully use deep-earth thermal potential of the ground and don’t require installation of expensive evaporators. Small area of ground works is also important: the diameter of a pit where the vertical gas tank will be placed is 2-2,5 meters. метра. 10 interesting facts about Italian gas tanks from «Antonio Merloni Cylinders Ghergo Group S.p.A.».